Supervised well behaved four-legged canines are welcome; however, there is a maximum of three pets per cottage. This number varies depending on the size of the animal, so please enquire. Pets must be fully vaccinated with flea, tick, and worming treatments up to date. The nightly rate for pets is $10 per pet per night. Our cottages are equipped with food and water bowls, doggy pick up bags and scoops. We also provide information for local dog grooming, doggy day care and local vets. Each Bungalow has a covered, fenced deck area with a secure gate which provides a safe and secure area for dogs to rest. There is plenty of room in the grounds for exercise as well as a dog friendly beach only a short 400m walk away. We would prefer that the dogs sleep on the deck - however, they may sleep inside at night on their own bedding if this is what they do at home. Pets are not allowed up on the furniture at any time. Dogs are not to be left unattended at your cottage for long periods of time. Excessive barking that disturbs other guests and our friendly neighbors is not acceptable. You will be asked to keep your dog with you at all times during your stay. There is a great doggy day care nearby which we suggest you use if you need to leave your dog for an extended period. The local Vet surgery is in Woolgoolga and they are available day or night to help with any of those unexpected circumstances that may arise. If you have any queries about bringing your pets to stay with us please contact us. We are very open and understanding when it comes to pets. Your hosts, Colette and Kelvin, will make you feel right at home in the unique fully self contained cottages. Inside you can enjoy free wireless internet, games, books or just relax in a hammock on the deck. 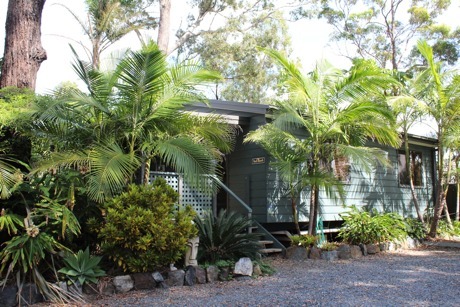 The cottages are surrounded by lush tropical gardens abundant with bird life and our local mob of Kangaroos. Relax in our beautiful surrounds or take a stroll on Safety beach, only 400 metres from your cottage. The local golf club is only 100 metres away. We are located just 2 kms north of Woolgoolga near Coffs Harbour which is approximately half way between Sydney and Brisbane. A 15 minute stroll along the beach will have you in the main township of Woolgoolga. Bookings and Enquiries can be made by sending a message or give us a call.